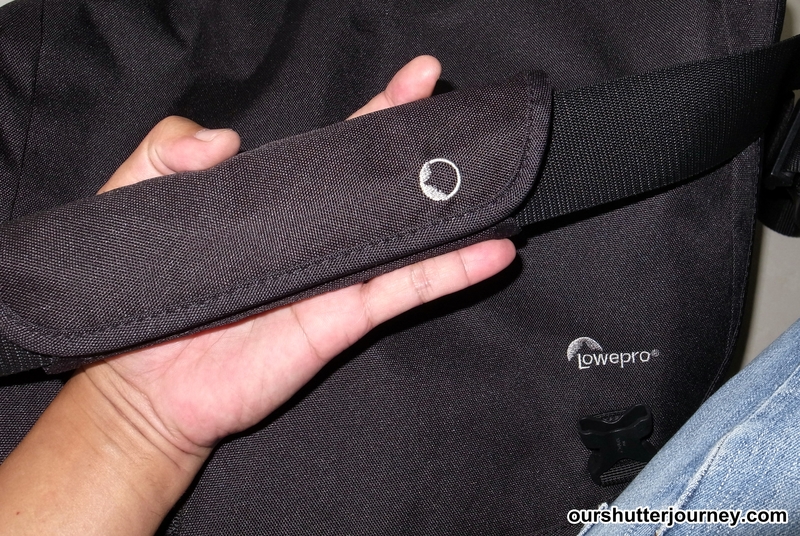 Picture: The NEW Lowepro Passport Messenger Bag. 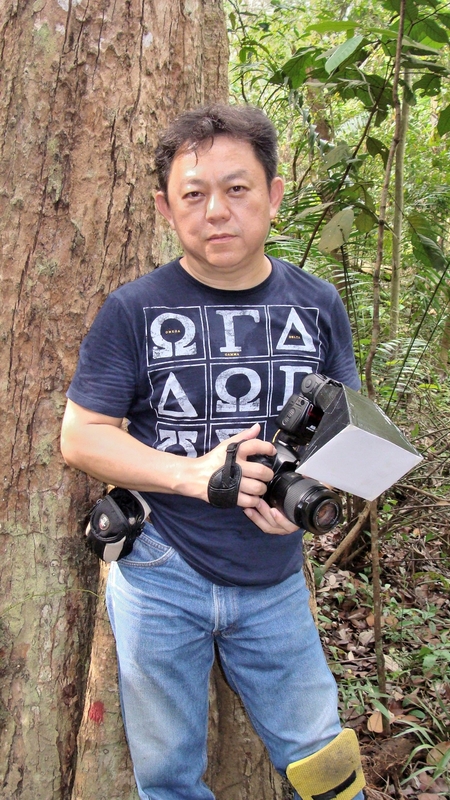 17th April 2014, Singapore – Lowepro recently released a few NEW Passport Series camera carriers and I was lucky to get hold of the Passport Messenger Bag from Cathay Photo. This medium-sized shoulder sling messenger bag was designed with the everyday photographer in mind. Why? Because the Passport Messenger has space for your camera, a space for your tablet and lots of spaces for your personal effects that you carry along daily. 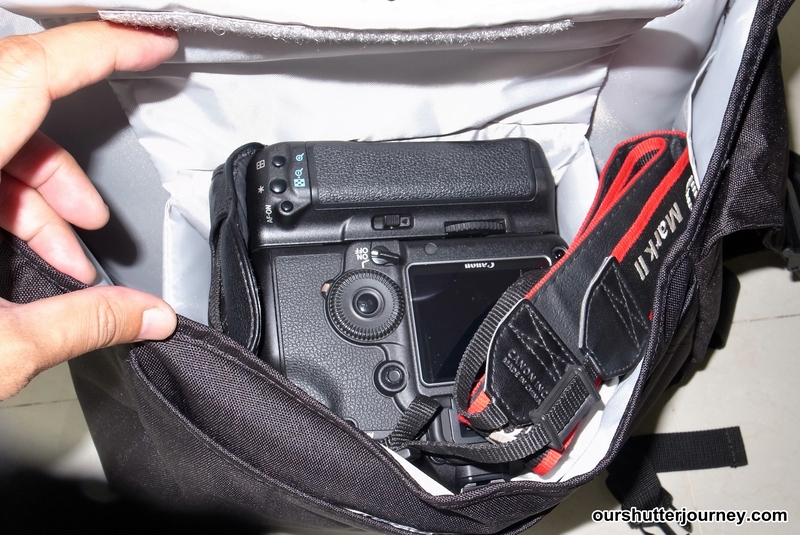 Although the official specifications by Lowepro stated that this bag was meant for a compact DSLR or other medium to smaller size cameras, i tried my luck with a much bigger camera. 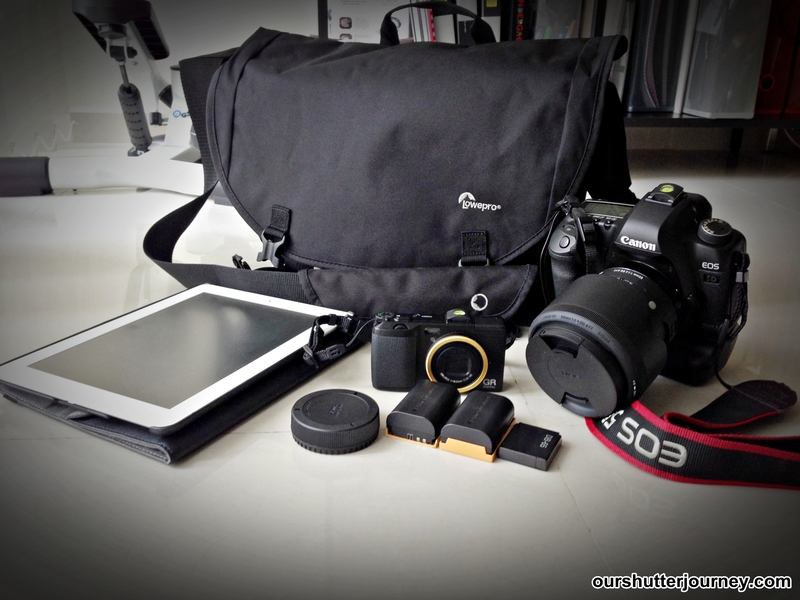 Picture: These are the items inside my Lowepro Passport Messenger Bag. Without following the recommended specs, I managed to squeeze in my Canon 5D MarkII mounted with a Sigma 50mm F1.4 DG HSM ART lens, a Ricoh GRIV, my iPad, the lens & body caps, spare batteries, my water bottle & a memory card pouch (not shown here). I was surprised that the Passport Messenger actually holds up all the above equipments – with some clever arrangement and space management of course. Here’s the official size. The Lowepro features a removable/ adjustable camera insert which you can fit in a a large DSLR body and have your lens separated and fit into the sides or simply fits any smaller DSLR with a smaller lens. But what I did (see below) was to place my Canon 5D MarkII downwards with the lens fitted and somehow it fits pretty nicely. 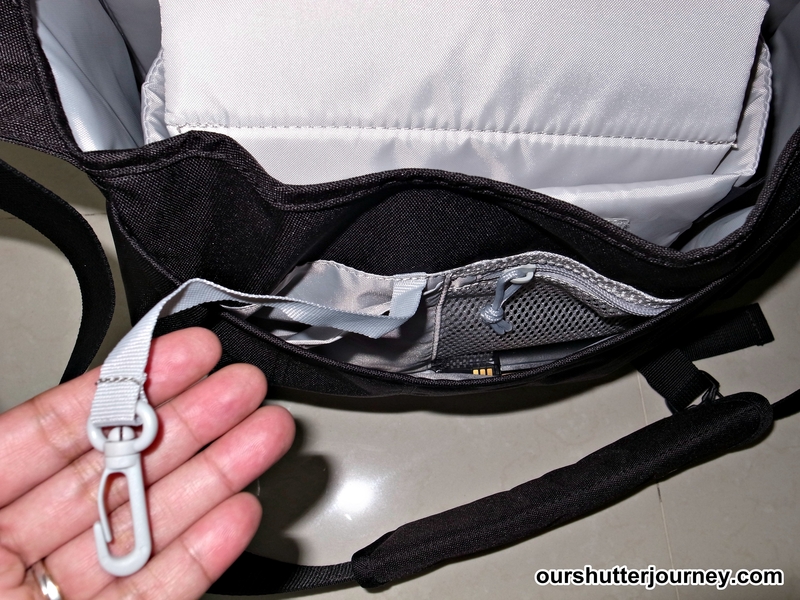 Picture: The removable camera insert inside my Lowepro Passport Messenger Bag. 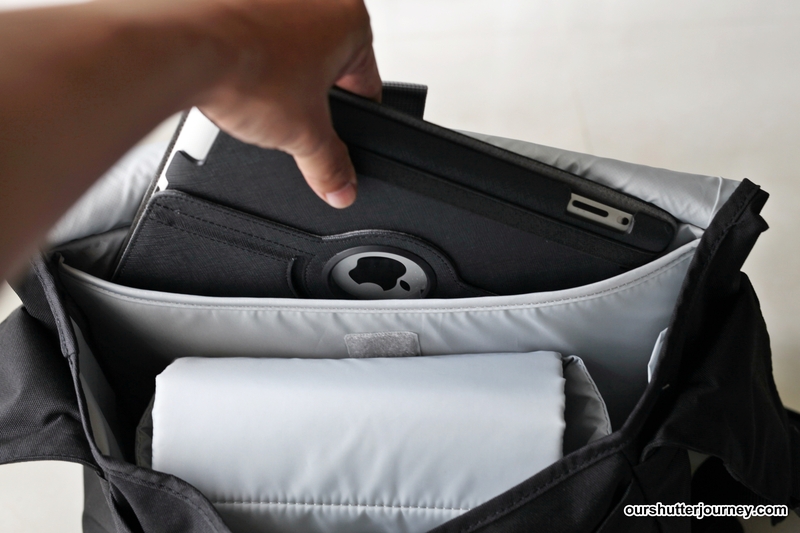 I like the compartment designed for personal tablets or smaller laptops and the thick foam will protect my iPad from knocks and bangs when I am travelling in a crowd. There is a velcro flap that keeps the iPad in position which is very sensibly designed. The front compartment has the usual hook for wet raincoats and there are many little compartments that I can store my batteries, car keys, memory cards, lenspen etc. For smaller loose items, there is a zipped compartment too so that it keeps things organized without messing up the bag. The thick shoulder pad is useful when I am carrying more weight than usual and it makes anyone carrying the Passport Messenger bag very comfortable. The shoulder pad is removable and this means you can just take it out and throw it into a washing machine. 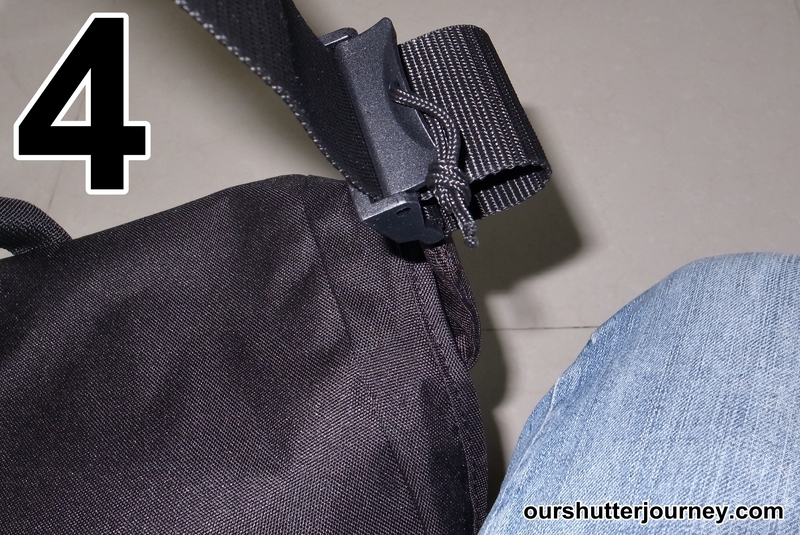 Do not forget that the shoulder pad is the very same part of the bag that absorbs your sweat. So washing is recommended. 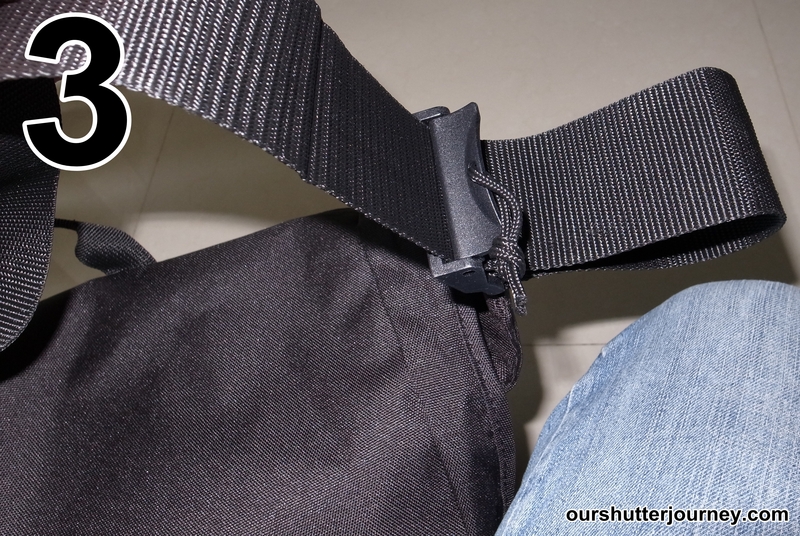 The cam lock buckle on the shoulder strap is another feature that I personally like very much. 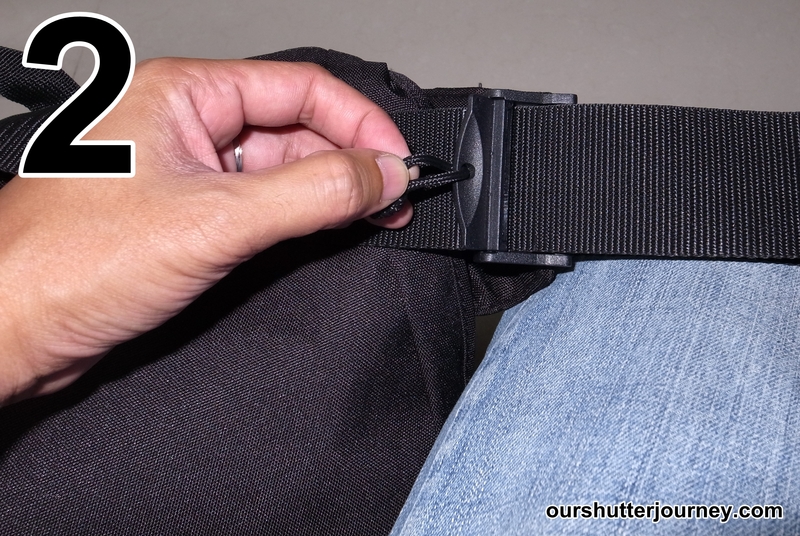 To adjust the length of the strap, simply put the drawstring to unlock the buckle. Then adjust the length to your liking easily & effortlessly. 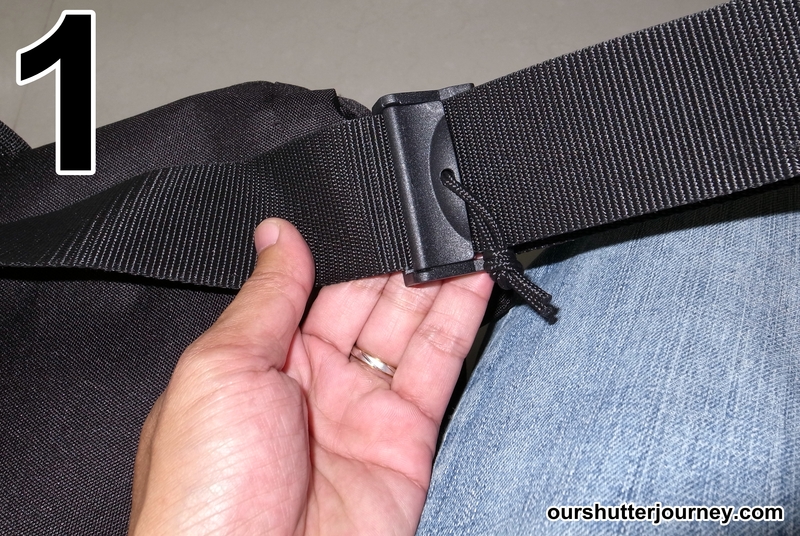 Once the desired length is acheived, simply press down the cam buckle to lock the strap in position. Personally, I will recommend the Lowepro Passport Messenger bag to anyone who travels around with a fair bit of personal belongings. The design of the bag is pretty discreet and low profile. It will take a trained eye to notice that this is a camera bag – in disguise. The paddings are well designed so that it protects whatever you are carrying in case of knocks. The sleek looking bag also comes in 2 color options, the pure black (the one you see here) and the sportier Grey & Red version. This bag is great for hand-carrying onto planes when you travel as it will fit into any space under the place seat so that you can retrieve your item easily. 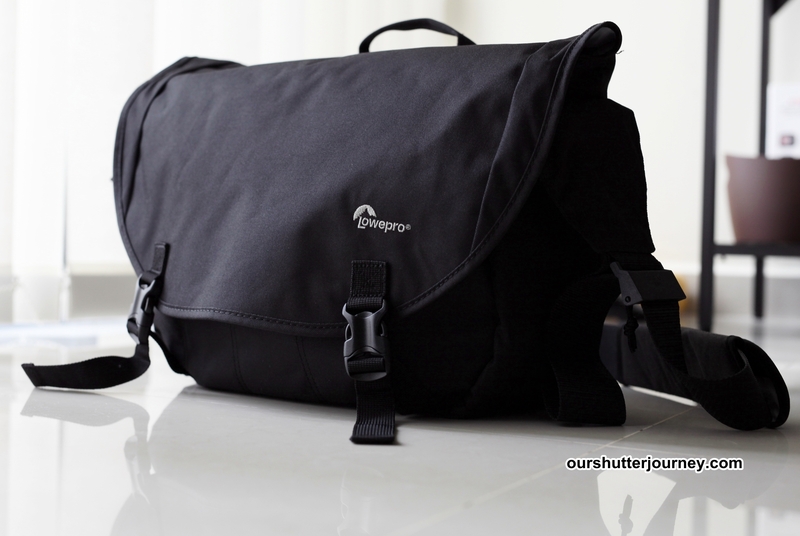 Priced to sell, this is a value-for-money bag from Lowepro that I think you should buy 1 too. For more information on the NEW Lowepro Passport Messenger, please visit here. Thank you Cathay Photo for the Bag, I love it. This entry was posted in Brand: Others (Cosina, Carl Zeiss, Leica, Mamiya, Samyang, Vivitar, Zenitar,etc), Group Test & Reviews, Photography Articles & Videos, Uncategorized and tagged Cathay Photo, LowePro, Lowepro Diary, Passport Messenger. Bookmark the permalink.